The recording, obtained by the ABC, documents two carers launching an expletive-laden tirade at the boy, who is profoundly disabled and can barely speak for himself. The incident happened while the boy was being dressed for school in 2016. In the recording, one carer tells the young boy that "I'm gonna' bash you" and threatens to cut his pyjama pants off with scissors if he does not cooperate. He is then called a "stupid f***" and told "stop hitting yourself … you f***ing wog" and the sound of slapping can be heard in the background. As the verbal abuse continues, the boy can be heard in the background sounding distressed and repeating the word "no". Then the audio suggests there has been a scuffle and the boy has been injured. Even though it is unclear exactly what happened, the male carer then discusses with his colleague how he will cover up the injury. "We'll just say he slipped over. If he did. F*** I hope I didn't graze bra." His colleague reassures him that: "You'll be right. Make something up." To which his colleague responds: "We'll say he slipped. Slipped on that. That looks grazed." The men then spend the next 10 minutes discussing what to do. "We'll just say he's f***ing rubbing his nose on the blanket it must have been itchy," one of the carers says. "Yeh, yeh that's what we'll say. That's it," the other responds. The carers then discuss how whatever they say "can't … make a full story just have to make sense". At one point it is clear the workers are concerned their conversation might be overheard and they discuss a neighbour who they believe is monitoring the house. One worker says to the other: "The window's open. Shh." And then one of them makes a troubling disclosure. "I just wanna f***ing beat these kids without any risk." The recording was made in 2016 in a group home for teens run by a not-for-profit organisation, which reported the matter to the Children's Guardian, Police and NSW Ombudsman. The family of the boy declined to speak to the ABC but did say they were distressed by the incident. The ABC understands the local police were unable to pursue the case because of legal issues. The police offered to have the carer's Working with Children Check revoked, but the family did not pursue it. The organisation which runs the home said the men were immediately stood down and sacked for verbal abuse following an investigation. However the ABC learned the carers were subsequently witnessed applying for another job, this time in a healthcare role in the aged care sector. The case adds weight to concerns about a lack of regulation in disability care. A spokesman for the group home said it did thorough checks on the carers before they were employed and responded swiftly to the incident. "It is an ongoing concern that unsuitable staff who have been terminated may go on to work in other sectors with vulnerable people or in other states or territories," he told the ABC. "Mindful of this, honest and accurate information is provided to potential employers upon request via reference checks. "This does not, of course, preclude workers from choosing to utilise deceptive behaviour to obtain employment elsewhere or in other sectors." 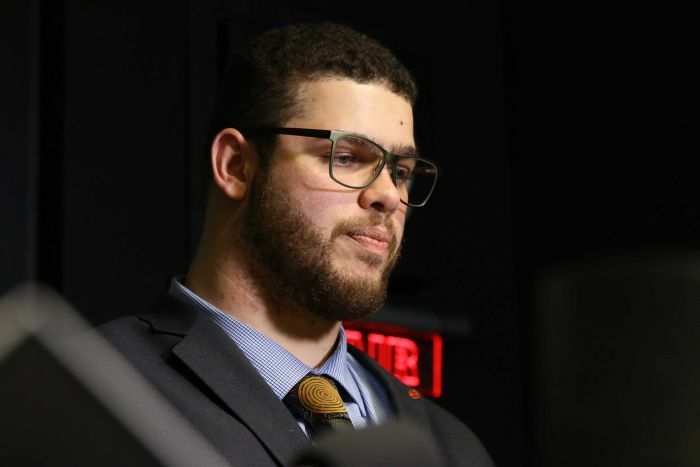 Greens senator Jordon Steele-John said the case showed why the royal commission into aged care should also include the abuse of people with a disability who were cared for in similar settings in group homes. "We see in this situation abusers moving between one system and another and we have no reason to believe that that also isn't happening in reverse," he said. "We see people who are beaten, we see people who are starved, we see people who are subjected to the most horrendous and physical violence, and we also see catastrophic levels of sexual violence. It is endemic. "There's just such a profound overlap here that it just doesn't make sense to do one half and not the other." He was horrified by the recording. "You wouldn't treat a dog in the same way those two men were treating that child and those kind of abuses need to be fully investigated," Senator Steele-John said. "In these systems we are managed as sub-humans." He said he wanted the Prime Minister to expand the aged care royal commission terms of reference to include people with a disability in group homes, but he had only seen "cold, hard thoughtless dismissal" in response to his concerns. "We saw … the Parliament basically decide that it wanted to pass up an opportunity for justice because it was simply politically inconvenient to do so," Senator Steele-John said. The Federal Government maintains carers will be subject to employment screening under the National Disability Insurance Scheme and providers will have to be registered. Prime Minister Scott Morrison has previously said he wanted the royal commission to be focused and it "can't be a royal commission into everything". Critics said a broad royal commission was the only way to deal with the real problems in the care sector. A Senate inquiry has recommended mandatory reporting and a worker registration scheme similar to that in the nursing industry.